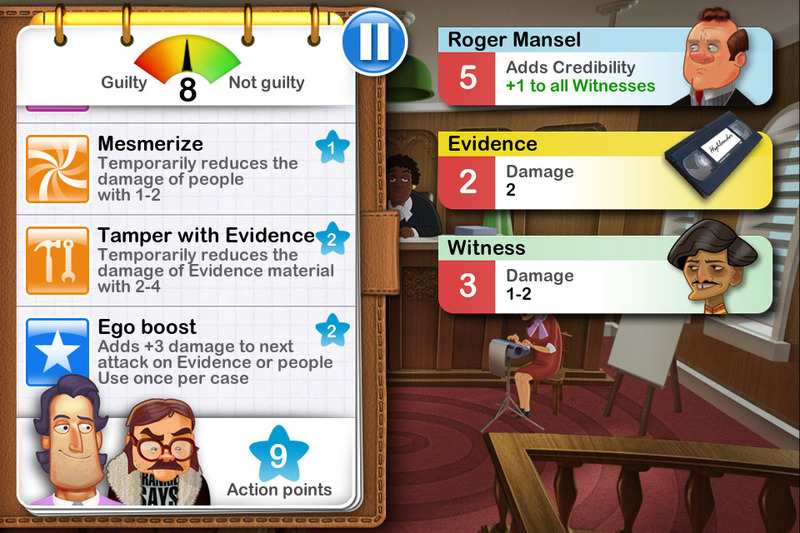 At first glance, Devil’s Attorney ($4.99) might seem like a shameless Phoenix Wright clone. You do play a defense attorney embroiled in courtroom drama, but unlike the naïve and justice-driven Phoenix, Max McMann is the eponymous devil’s attorney. His clients did the crime, and they pay him the big bucks to avoid doing the time. Also unlike Phoenix Wright, Devil’s Attorney doesn’t take you through adventure-game-style investigations and conversations, but breaks down cases into series of turn-based battles. In each case, you take on a team of units consisting of witnesses, evidence, and prosecutors in turn-based battles. You fight back against the prosecution’s team using an array of courtroom skills. Some skills deal damage, others mitigate the prosecution’s defense by lessening their damage, causing witnesses to attack themselves, or neutralizing a specific unit for one turn, and still others increase your case defense. All skills cost varying amounts of action points, and you receive only a teensy amount of AP per turn. Your goal is to determine how to spread your AP across skills in order to knock out the opposing units as efficiently — and, if you want to collect case bonuses, as quickly — as possible. Target evidence first and expert witnesses will drop away. Use the Objection skill to bench a prosecutor whose damage equals her hit points, then bust out Reverse Psychology to make a witnesses with high attacks turn on themselves, eliminating them from the equation. In another instance, you might decide to focus on knocking out a prosecutor who heals her witnesses at the beginning of every round. This particular attorney can’t deal damage directly; without her team, she’ll concede. Devil’s Attorney gives you a few skills out of the gate. You learn new skills and acquire permanent perks by purchasing furniture, accessories, and decking out your sports car. Material goods add points to one of three skill trees, or grant permanent bonuses such as starting cases with more AP. You’ll surely want to buy out everything, but there’s a catch. All items fall into categories such as beds, closets, wheels for your car, and so forth. Each category presents three items that function like doors: Once you walk through one, the others close forever. You’ll want to deliberate over each and every purchase to make sure you can acquire the skills you feel will best benefit your court strategy. 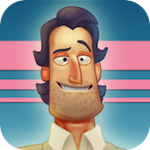 That emphasis on decision-making, which feeds into character-building, is what makes Devil’s Attorney such an addictive game. Each prosecution unit’s special abilities, the finite AP at your disposal per round, your particular furniture and accessory choices–all those elements frame each case as a puzzle to be solved, and the puzzle changes based on the skills you pick for your defense toolbox. There is no one surefire solution. There are merely different combinations of skills based on the skills and perks you choose to pursue. Every case is a deeply strategic and satisfying battle, and the victories mean more because you emerged victorious using tools you chose for the job. Excellent writing and voice-acting adds icing to the gameplay cake. Before each case, Max enters verbal sparring matches against the opposing attorneys. The results are always and humorous. Each conversation also weaves a thread that ties into future encounters with those attorneys, and contributes to an overall story that reveals itself over time. Just a few cases in, I found myself pulling late nights so I could play just one more turn, solve one more case, and because I was eager to play the fly on the wall during Max’s next face-off with peers I’d grown to like. Devil’s Attorney‘s flaws are few but somewhat irksome. Each accessory or furnishing up for grabs describes how it affects various skills, but you can only read descriptions of skills you earn through purchases, not the ones you’re given by default. Without being unable to look at certain skills outside of courtroom battles, I found it difficult to determine if a certain perk would benefit me. 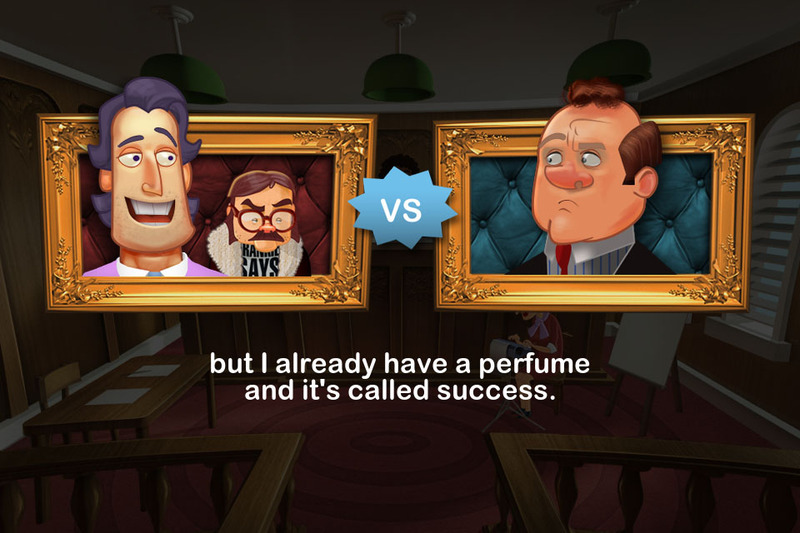 On a minor note, some players will find the first dozen or so cases simple, but finishing the game unlocks a harder difficulty that should test even the most devious of criminal lawyers. 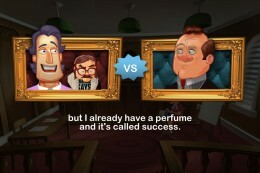 Like Capcom’s courtroom drama, Devil’s Attorney is an addictive puzzler whose courtroom metaphor for battle makes for one of the most unique and absorbing games you’ll find on mobile or any other platform. Like Max McMann says, morality is a cheap perfume, but his game’s already got a perfume, and it’s called success.